Protective packaging specialist, Pregis Limited, will be introducing the availability of Sharp bagging solutions at packaging events across Europe this coming Spring. has been solving customers' packaging challenges for over 30 years. European customers will now be able to experience the benefits of this new packaging technology for the very first time. Visitors to the forthcoming shows will be treated to live demonstrations of the SX, allowing them to see the ease at which high volumes of all kinds of goods can be packed, and how it reduces handling and labour costs, eliminates waste, and speeds up dispatch times. Compact, lightweight and simple to use, the SX Continuous Roll Bagging System is a semi-automatic, all-electric bagging system that requires no air compressor, meaning that it can be plugged in anywhere and is ready to go. The system then simply loads, prints and seals bags in one smooth process. Sharp's E-Z Bags, which come in a range of sizes, feed through the machine, are labelled or addressed, then opened automatically with the cross-flow fan which channels high volume, low pressure ducted air for precise bag opening. The operator then simply inserts the goods and the bag is then automatically sealed and released, ready for dispatch. 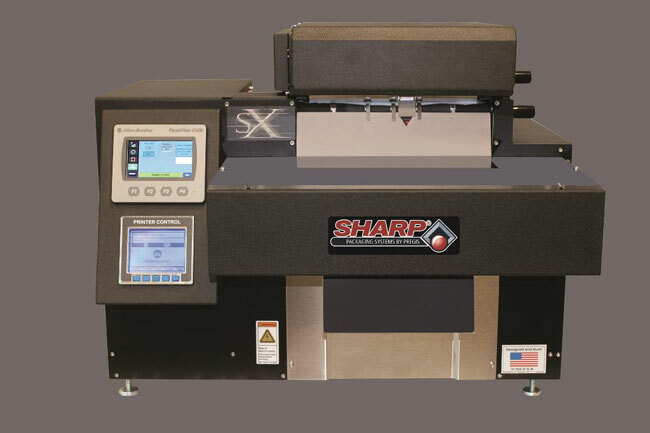 The wide 10cm print head allows users to print unique bar codes, shipping information and graphics directly on to Sharp's E-Z BagsR. Using its 200dpi, or optional 300dpi thermal transfer printer, high resolution and superior quality colour printing is always consistent. The electronic 'ribbon out' sensor prevents ribbon waste, and finished rolls are quick and easy to change, minimising downtime. The wide colour touchscreen controls allow users to choose from a range of bag sizes and pre-set the seal times for each bag. Users can also fully customise bag labels with Windows TrueType fonts, scalable text and text blocks including date and time formats, as well as adding multiple graphic formats up to the maximum print area. Other touchscreen options include linking to databases where users can fix, vary and merge text fields, set 'best before' dates and manage concessions and manage auto incrementing/ decrementing text, counters, and bar codes. The SX Continuous Roll Bagging System is ideal for small or large mail-order fulfilment for ecommerce or industrial brands. It can be used standalone, on a work bench or integrated with other picking, packing, weighing or conveyor systems. Maintenance costs are also significantly reduced due to all parts being off-the-shelf - this means they are simple to change and cheaper to replace.